Our exciting journey from a family of two to a family of three! So it looks like we’re a go! At this point, I’m still in disbelief. The self-preservation instinct kicks in, and I just don’t think about the fact that I’m actually pregnant. I was extremely blessed in the symptom department – no morning sickness, no significant nausea, only a little tired each day. So it just didn’t feel real. As time passed, I did start noticing some food aversions – primarily to turkey (boo! That’s what we have for lunch every day!). I actually didn’t feel much like eating, which was exacerbated by my overactive gag reflex. If I gagged on something, it was over….no more eating for me. So I ended up losing about five pounds between my 8 week and 12 week appointments, despite only being physically sick once. Not complaining, since my midwife only wants me to gain 15 lbs the entire pregnancy! That’ll be a challenge. We celebrated Bennett’s birthday in March, closely followed by mine in April, with a trip to Perdido Key for a long weekend. Had a great time not doing a darn thing! My only complaint was that my favorite restaurant, Macaroni Grill, has changed the recipe for my favorite dish (chicken scalloppini). No fair! But we persevered and had a great mini-vacation. 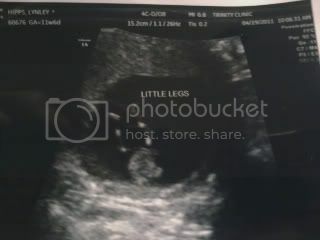 The end of April brought on my 12 week appointment, where I had to do the glucose test (very early compared to most pregnancies, but with my history of PCOS and weight problems, they wanted to stay on top of things if I was going to develop gestational diabetes). So I had to drink the nasty flat orange soda, which was even worse since I’d pretty much been drinking only water since my BFP. But my sugar levels were fine – whew! I’ll retake the test at 28 weeks or so. 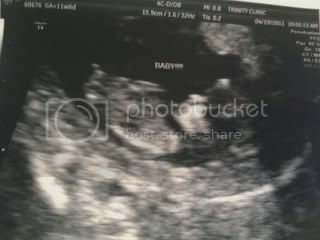 I had another ultrasound at this appointment – everything looked great! The baby’s heartbeat was around 178, which is pretty high, but the u/s tech said that it’ll start dropping now as the baby grows. Did you catch the caption on that last one? Boyish! The u/s techs said they’d give it a 70% chance of being a boy. 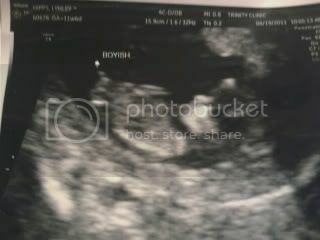 We’ll know more at our gender ultrasound at 16 weeks. Exciting!!! Previous Getting back on the horse… Next Obsess much?